Watson, P.J. 2018. How well do AR5 sea surface-height model projections match observational rates of sea-level rise at the regional scale? Journal of Marine Science and Engineering 6: 11, doi:10.3390/jmse6010011. In providing the rationale for his paper published in the Journal of Marine Science and Engineering, Watson (2018) writes that "despite the increasing complexity and resolution of [climate] models, their utility for future projections will always be conditional on their ability to replicate historical and recent observational global and regional data trends of importance (such as temperature, sea level, CO2 trends, etc.)." Indeed, model projections must always be evaluated by observations, regardless of their assumed complexities and abilities. Without such validation, and a thorough understanding of a model's predictive limitations, its output should never be utilized in the formation of policy. And so it is a welcomed exercise that Watson set out to compare model predictions versus observations for one of the key parameters in the climate change debate -- sea level rise. In his words, Watson's work "provides a snapshot of how closely current rates of sea-level rise from observational data records (tide gauges) are represented by the ensemble mean of the [IPCC's] AR5 model-projection products at the regional scale, considering 19 sites across the global ocean over the period of common coverage (2007-2016)." And to accomplish this comparison, Watson applied singular spectrum analysis to "efficiently isolate the externally (or climate-change) forced signal from all other contaminating dynamic influences (including internal climate modes)" for both types of data, i.e., model projections and observations. The results can be summarized in the figure below. Figure 1 presents the average rates of sea level rise over the period 2007-2016 for each of the 19 globally-distributed stations with associated error bars in the upper, middle and lower panel. It also displays the AR5 ensemble model-predicted average rates of sea level rise for three different greenhouse gas emission and future temperature scenarios (RCP2.6, RCP4.5 and RCP 8.5 in the upper, middle and lower panel, respectively). Two important points can be summarized from this image: (1) the error margins of the IPCC's model predictions of future sea level rise are quite large and (2) those wide margins "[mask] the fact that the mean velocity for the model-projection products exceed observational records for nearly all stations and Representative Concentration Pathway (RCP) [scenarios]." And with respect to how great in magnitude the model projections of sea-level rise are from reality, Watson reports that when all station records are considered across all RCP experiments the average gap is between 1.6-2.5 mm/year. To put this difference in perspective, over the past decade the ensemble model-mean projections of future sea level rise are approximately twice the magnitude of that which is observed in the tide gauge observations. Commenting on these important findings, Watson understates the obvious by stating "evidence suggests the AR5 projection-model outputs for sea surface height appear to be rising at a faster rate than the observational (tide gauge) records over the decade of common coverage," adding that his work provides "an early warning sign that the evaluation of ocean model components with respect to projected mean sea level could be relevantly improved." Or, in plain English, this work demonstrates that the model projections of future sea level rise are garbage, invalidated by real-world observations despite their large error bars. Consequently, another phantom pillar of the climate alarmist movement is swept away by truth. How long is it going to take for the real climate deniers to acknowledge these and other observational facts that falsify their narrative of dangerous future climate change due to rising CO2 emissions? Figure 1. Average rates of sea level rise over the period 2007-2016 for nineteen globally-dispersed locations. 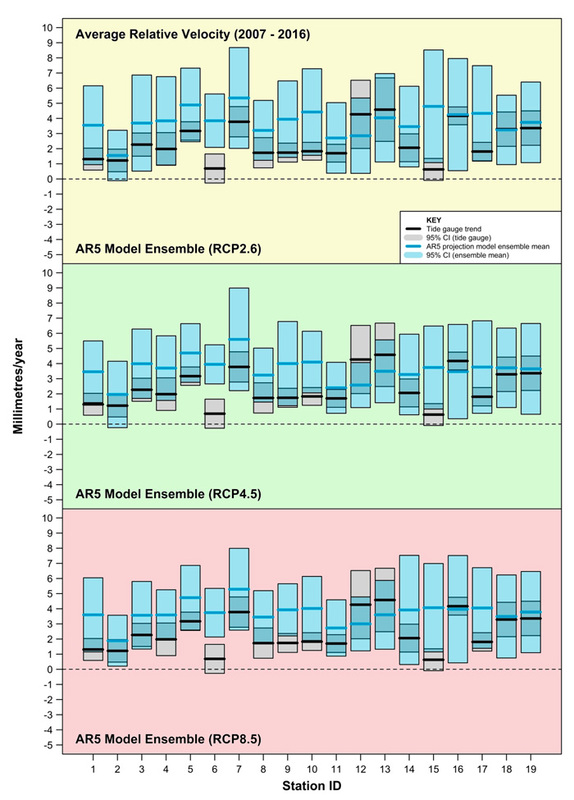 The charts directly compare the observational record (tide-gauge analysis) and corresponding AR5 ensemble-model projections for three model scenarios (RCP2.6, RCP4.5 and RCP8.5). Source: Watson (2018).